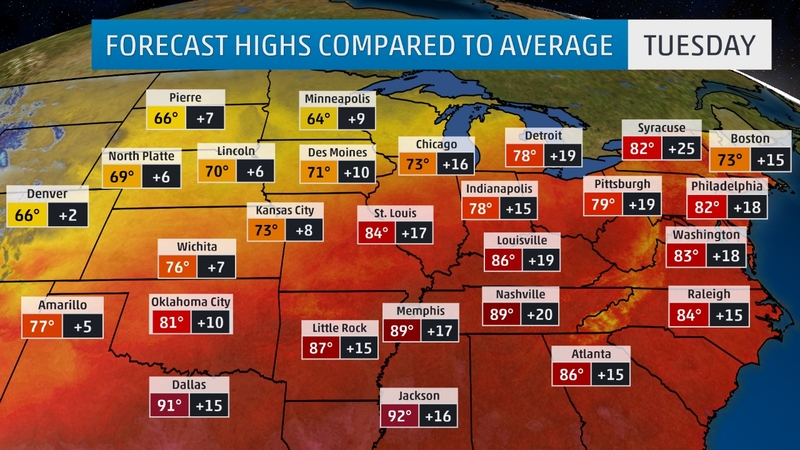 Record-breaking warmth has gripped parts of the Plains the last couple of days, and this heat will continue to spread to the East Coast through midweek. For some locations, October will feel more like late summer thanks to this taste of "Indian Summer." 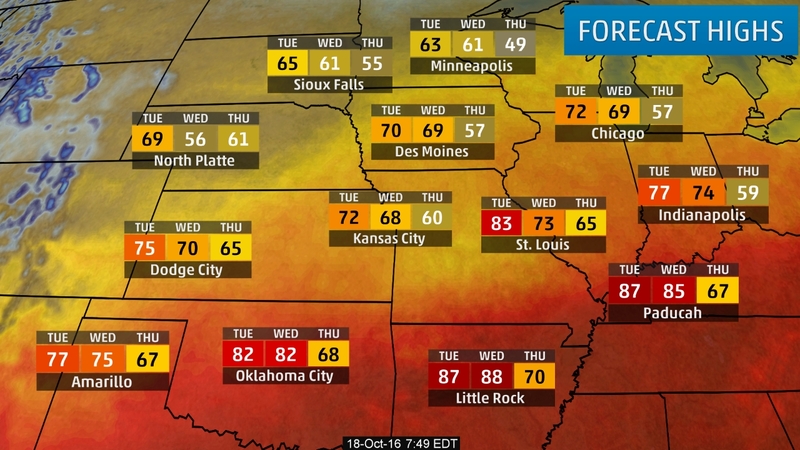 Changes are on the way, however, as a return to more typical fall temperatures sweeps across most of the central and eastern United States by late week. This dose of Indian Summer is thanks to an area of high pressure off the Eastern Seaboard coupled with a migration of the jet stream to the Upper Midwest and eastern Canada. Dodge City, Kansas, set a new record high for the entire month of October on Monday, topping out at 101 degrees. Records date back to the late 1800s in the southwestern Kansas city. This broke the previous October record high of 99 degrees, set just the day before on Sunday. A 100-degree high temperature was recorded in McAllen, Texas, on Monday. This was the latest 100-degree day on record there, surpassing the previous date of Oct. 15, 1957. St. Louis topped out at 91 degrees, breaking the previous record high of 88 degrees. Nashville, Tennessee, reached 86 degrees tying the record high from 2007 and 1965. Tulsa, Oklahoma reached 90 degrees, which tied the record high from 2005, 1947 and 1921. La Guardia Airport in New York City set a new record high by reaching 83 degrees. The old record was 80 degrees. Amarillo, Texas, topped out at 98 degrees on Sunday, making it the warmest day so late in the season there. It was also just one degree shy of tying their all-time October record high. At least one location in Texas reached the triple digits on Sunday. The panhandle town of Perryton near the Oklahoma border was 102 degrees. Slapout, Oklahoma, also hit 102 degrees on Sunday, making it the hottest temperature so late in the season for the entire state, according to the Oklahoma Climate Survey. Several daily records were set in the Plains on Saturday, as well. Madison, Wisconsin only dropped to 65 degrees, previous record was 61 degrees. Dubuque, Iowa only dipped to 69 degrees, previous record was 61 degrees. Chicago, Illinois saw a low of 67 degrees, previous record was 63 degrees. Kansas City, Missouri only dropped to 71 degrees, previous record was 67 degrees. St. Louis, Missouri reached a low of 72 degrees, previous record was 66 degrees. Paducah, Kentucky only dipped to 76 degrees, previous record was 64 degrees. Wichita, Kansas only dropped to 70 degrees, previous record was 68 degrees. Dallas, Texas recorded a low of 73 degrees, previous record was 72 degrees. There were also records set for highest dew point so late in the year on Monday. Rochester, Minnesota reached a dew point of 68 degrees breaking the previous record of 68 degrees on October 13, 1962. La Crosse, Wisconsin tied the highest dew point recorded in October with a dew point of 70 degrees. This was also the highest dew point so late in the year, previous record was 70 degrees on October 15, 1962. Highs in the 70s and 80s will be plentiful in parts of the Midwest, South and East. Yes, even a few 90s are expected in the South. Dozens of daily record highs will likely fall by the wayside, and some more locations may set their record warmest temperatures so late in the year. And some morning "low" temperatures will feel more like average mid-October highs in some areas. Several cities may continue to set record warm low temperatures as well. 80s will persist in the Northeast at least as far north as the Syracuse-Albany corridor. 80s will persist in the Northeast at least as far north as New York City. 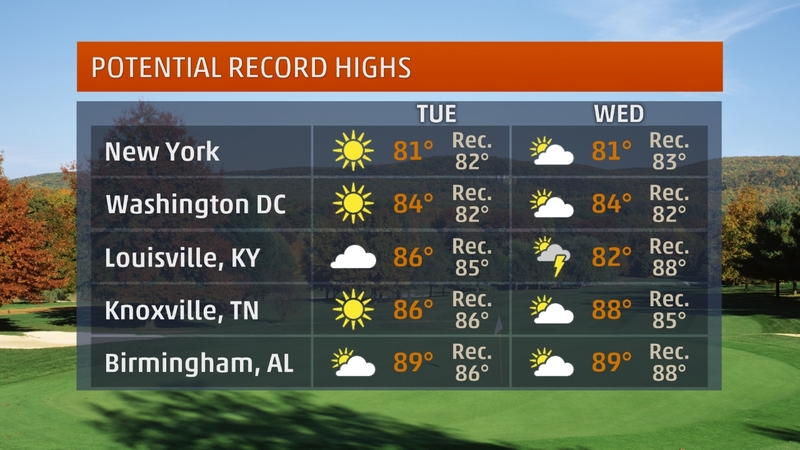 Daily record highs are possible from the Northeast to the Deep South. By late this week, a cold front will have swept away the record warmth, sending temperatures back to levels more typical of fall. Cooler air will first sweep into the High Plains of Texas, Oklahoma and Kansas on Tuesday. Dodge City, Kansas, may only be in the low 70s Tuesday and Wednesday, just days after seeing all-time October record warmth. Temperatures will gradually trend back to near average for this time of year across the nation's entire midsection Wednesday into Thursday. Along the East Coast, highs will be closer to average Friday into the weekend. 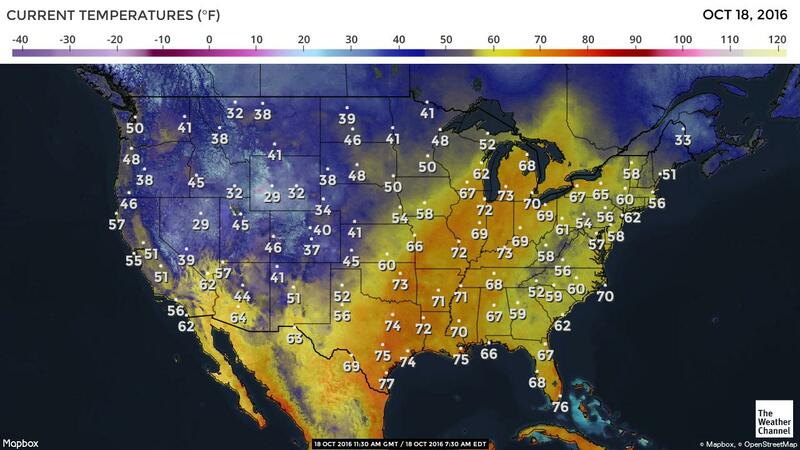 By Friday, highs will be in the 50s and 60s in the Plains and Midwest, with 60s and 70s in portions of the South. Dew points will also drop, allowing the crisp fall air to return. Low temperatures will also drop with temperatures up to 10 degrees below average in the central U.S. to end the week. Lows will tumble back into the 30s for much of the Midwest and northern Plains Friday and Saturday mornings.